As you may have noticed, for SNSD‘s Bad Girl music video the girls wear styled in pieces from Joyrich‘s Spring and Fall 2011 collections. Fans of Seohyun and Sunny’s look will be glad to hear that PLNDR currently carries the Cat Denim Pants the girls wore for 50% off, at just $44.99 in the Bundle up sale. Sunny wore her pants as shorts, this would be a great D.I.Y oppurtunity! In order to access this sale and more you have to become a member here. As always, rep code Kstyle, will save you 10% off each item and if you are a first time shopper on PLNDR you will receive $10.00 store credit after your first purchase. Happy Shopping! For the August 2009 issue of Elle Girl Magazine girl Group sensation SNSD (Girls Generation) were the featured models. The pictures featured in the editorial are adorable. 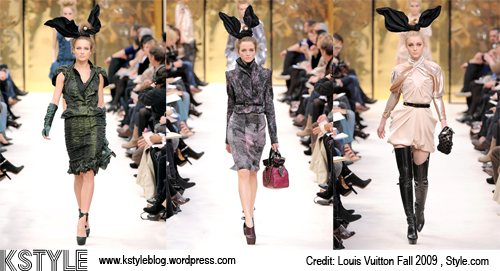 It was a European feel, but the Louis Vuitton and Maison Michael‘s head accessories add a sense of cuteness. The pink version is also from the Fall 2009 LV collection. Jessica, Tiffany and YoonA also wear animal styled head bands from Maison Michael. Like the look? 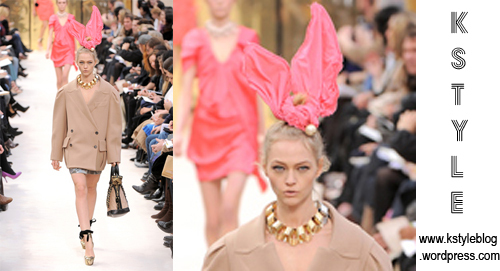 Louis Vuitton sells a smaller, head band version of the bunny tie.